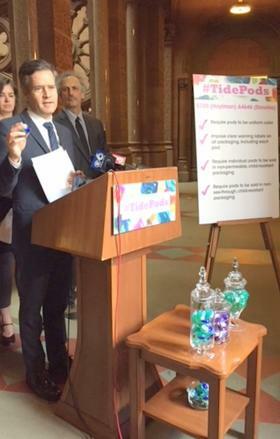 Senator Hoylman says there’s an average of 30 incidents a day of young children trying to eat the pods, and two deaths have resulted. They say seniors with dementia are also at risk, and six adults have died eating the detergent. They are asking that the pods be wrapped in child resistant packaging, and be made in a duller, more uniform color. They say if the pods are less attractive, it might quell what’s become known on social media as the Tide Pod challenge, where teenagers record themselves biting down on the pods.